Ahhhh, the brew pub. Sitting at the bar, eating snacks, enjoying the local brews, and catching up with my main man. No dressing up in scratchy, uncomfortable outfits. No making small talk with people you chose not to keep up with anyways. No trying to update your dancing style from the 80’s while dancing to an 80’s cover band. 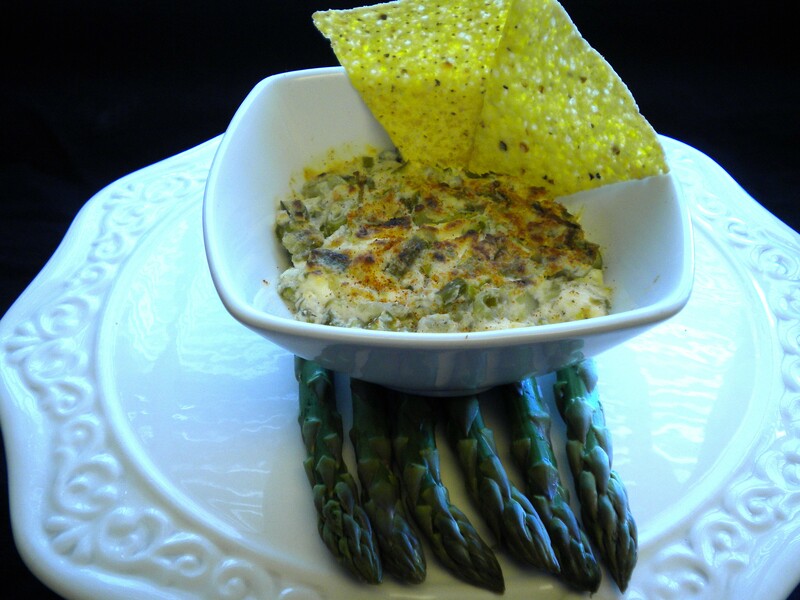 This weekend included such an evening, and while eating some deliciously cheesy artichoke dip, I figured that just perhaps make this my own with local asparagus and some calorie pinching techniques. First of all, the asparagus in this needed to be clearly present. 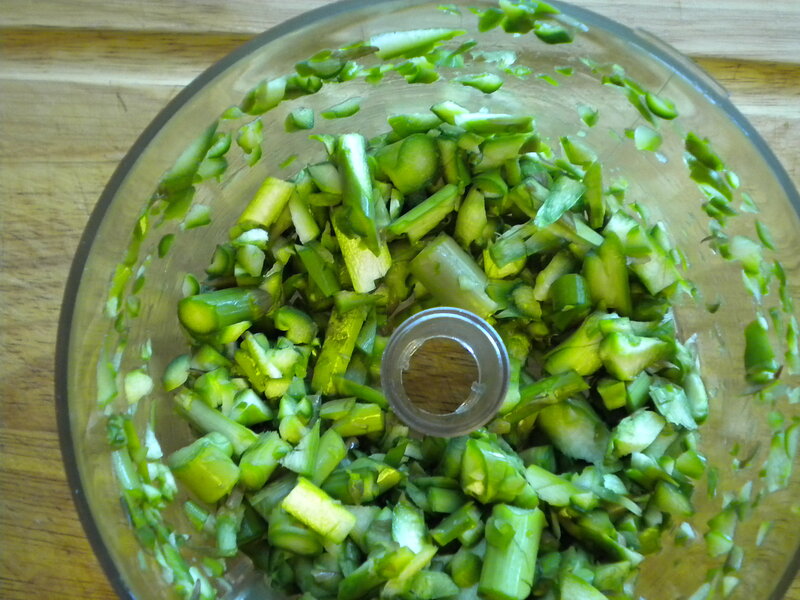 Due to its more delicate flavor, the requisite jalapenos in most any cheesy in in our abode were 86’d. 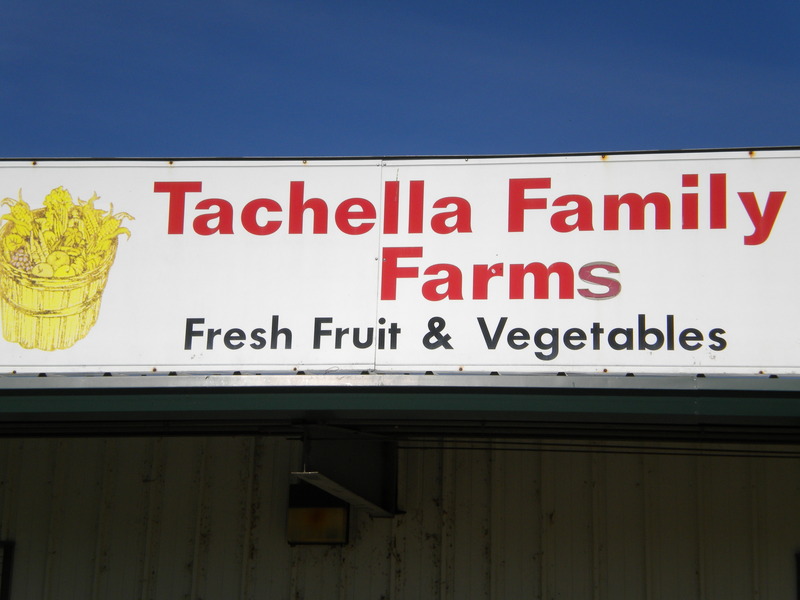 While at Tachella Family Farm, I spotted a bag of small artichokes on the clearance table due to their browning tips. Bingo … more fresh produce. After all of the bother in preparation of the lovely thistles in the first trial, I’ll use frozen or canned artichoke hearts next time, as reflected in the actual recipe below. The asparagus does need to be fresh. It is all about the asparagus! I used a Cooking Light recipe for Cheesy Spinach-Artichoke dip as the basis for this plan, then just winged it from there. Enjoy! 2. Quickly cook the asparagus pieces in a pot of boiling water for 1 minute. Rinse with cold water in a strainer to stop the cooking process then drain thoroughly to remove excess water. 3. In a mixer, blend the cream cheese, sour cream, and mayonnaise on medium speed until smooth. Add the Parmesan cheese, milk, green onions, red wine vinegar, black pepper and mix on low speed until blended. Add the asparagus and artichokes and mix until just combined. 4. Place artichoke mixture in a 1 to 1 1/2 quart baking dish, sprinkle with the cayenne pepper, and bake at 375 until cheese is melted and the mixture bubbles around the edges, about 30 t0 40 minutes. Serve with pita or tortilla chips. I served this with tortilla chips, but it would be better with pita chips. To make your own pita chips, cut each pita into two rounds, then into wedges. (I like sixths) Lay them on a baking sheet, rough side up. Lightly spray with olive oil, sprinkle with kosher salt and freshly ground pepper, and bake at 350 for about 10 minutes. Delicious! Why is is that every three years or so I have to relearn that cooking my own artichoke hearts is a big pain? Also, it just breaks my heart to toss all of those lovely leaves in the process. This is pretty vegetably, but I’m sure the you could even up the proportion of asparagus if you’d like. This was the first time I’ve included red wine vinegar in a cheesy dip. It was good! But, I’m a gal who doesn’t shy away from vinegars, either. Summer is here and the livin’ is easy. My strategy this year is to not only enjoy the local bounty today but to also save some for a rainy day. So many years we just gorge ourselves on the local produce, and honestly think we never want to see it again. Then the winter months arrive, and surprise, surprise, we’re ready for a taste of summer. At our local Farmer’s Market and in Lon’s farm stand, basil is ruling the roost. So, pesto it is! A few batches of pesto creates treats for months to come. The Cooking Light magazine has bunches of wonderful summer time treats in the current issue, go figure, but several with pesto caught my eye. This was not one of those nicely planned, hmmmm, I’m making pesto, what else can I use it in this week kinds of things. Oh no! This was one of those, I want to make this, and that, and that other thing, and oh my, what a surprise that they all involve basil pesto. And at this point some people have their radar way up, considering the word “craving” and may I just stop you right now. No, nope, nada. This is really just about the love of the green. Really. 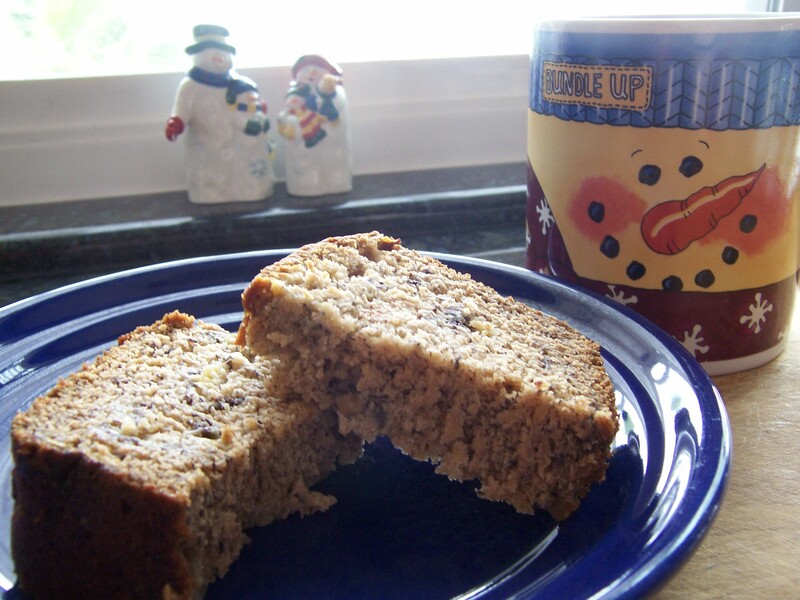 Warning, this is another recipe that will make measuring mavens crazy. These proportions worked for three hefty bunches of basil. But really, pesto is forgiving … you can do it! Enjoy the basic basil pesto along with the sandwich pesto mayo and pesto dip options! 1. Add add basil leaves, garlic and pine nuts to food processor. Pulse several times until roughly chopped. It should look like bulgar at this point. 2. Add parmesan and pulse processor again. Slowly add olive oil until it gently puddles at the top of the pesto. More oil may be needed depending on the temperature that day. 3. Taste. Add salt and pepper as needed. * The parmesan adds a bit of saltiness, so do taste the pesto after adding the cheese and before adding the salt. * Don’t get frightened of salt here .. up to a point it just makes the flavor burst! The warm days and evenings of November were delightful. Grilling dinner on the back deck, long walks along the levee, knowing that others outside California were not so lucky … ahhhhhh, the good life. Some years, summer does seem to trail off well into October before Fall arrives, but this year was even later. 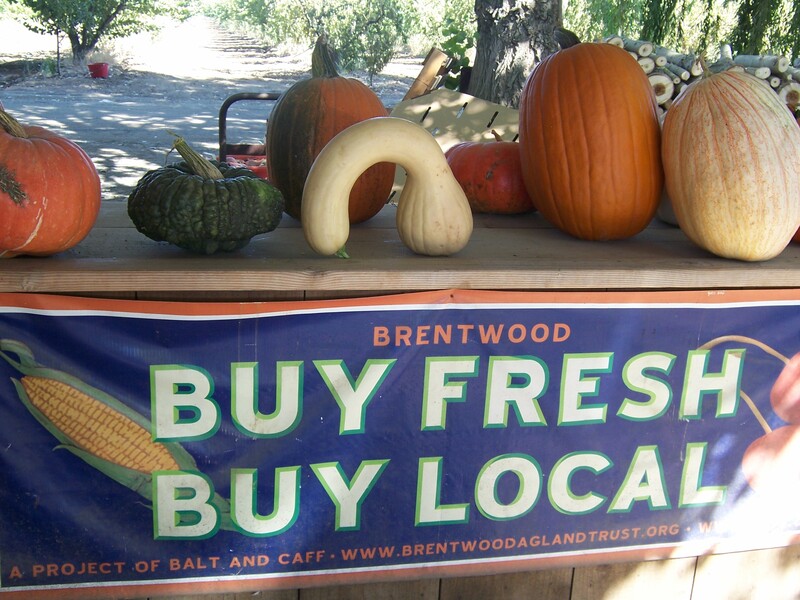 For those foodies who love to live local, there are benefits. As in, vegetable stands that are still open. Amazing. Enjoy the pics of the onset of Fall in my little neck of the woods. 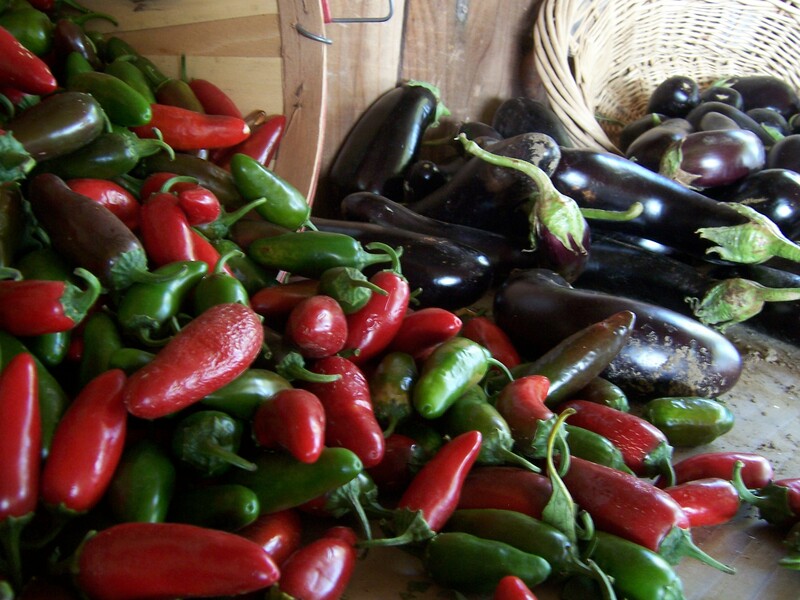 Oh, and those beautiful peppers? Find a few of them in the Spicy Bean Salad. 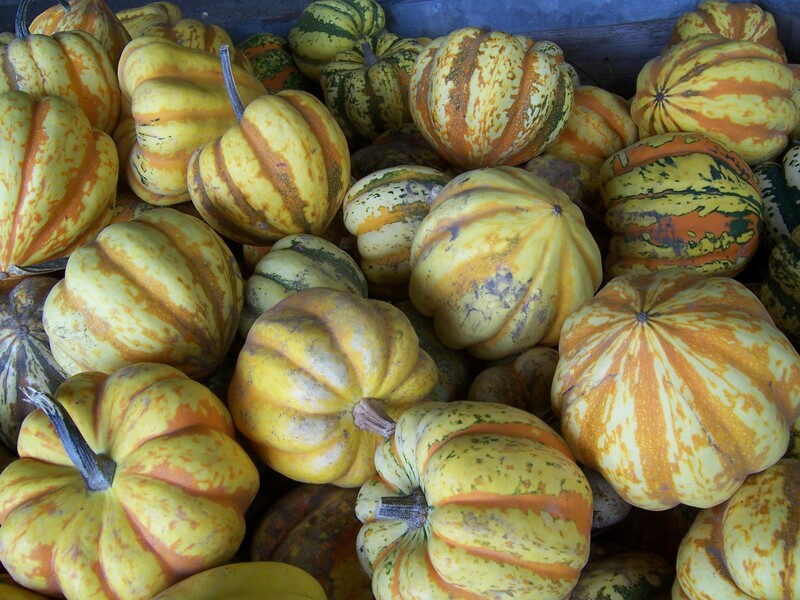 Farm Stands in November? You Betcha! Smith Family Farm, I love you! What a thrill it was to learn that my “go to” place is still open in November. Word had it that the end of October would be it for them, but they are still going strong in November (weekends only). And, they even gave me the inside scoop that whenever they do close up the larger farm stand, which will likely coincide with the opening of their Christmas Tree Farm, they will STILL be selling whatever their land keeps producing back by the trees. These folk are serious about keeping our community well fed with their local fare. I picked up a few tomatoes for some tortilla soup, and while they don’t have that summer kissed sweetness, they still taste of tomato, unlike the grocery store variety. Butternut squash is everywhere. I guess that either they over planted or everyone just got tired of it collectively. 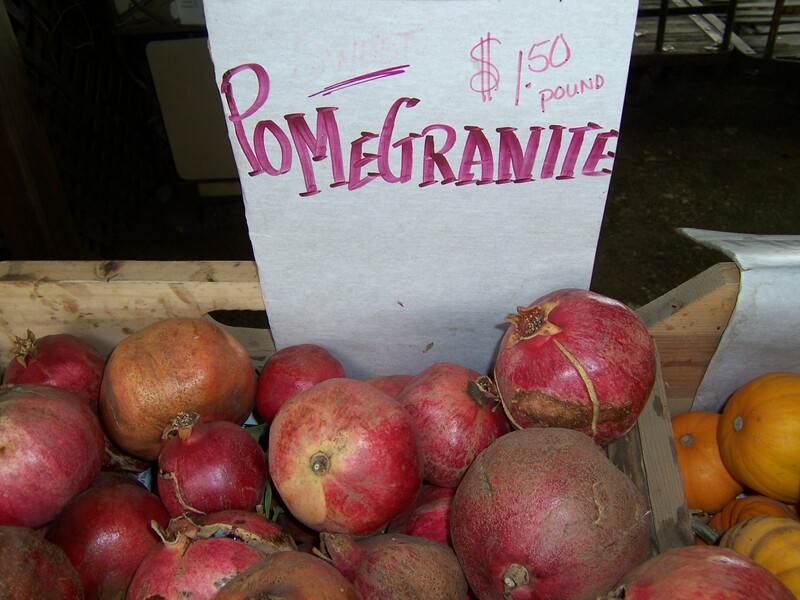 Hmmm..
Pomegranites are big around here now, but I’ve just never gotten into them. I see them as the sunflower seed of fruits … lots of work for little gain. Yet I know they have a devoted following. Peppers? Oh yeah! They’ve got peppers galore! Now that is a beautiful sight. Grabbed some of those also for the tortilla soup. Can’t have enough of those. I hadn’t ever given the pimento peppers a second look, immediately linking the name to the green olive stuffing stuff. Oh my, do give these little beauties a try when you have the opportunity. 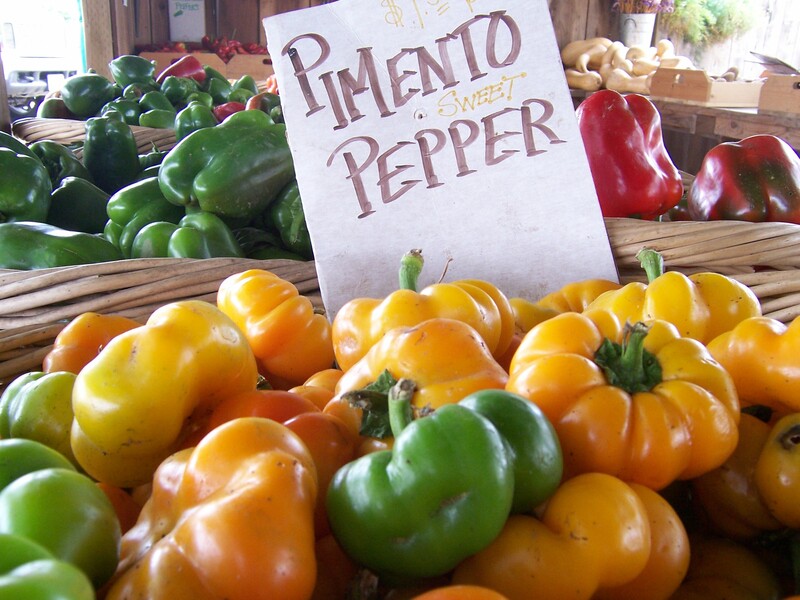 They have the feel and sweetness like a bell pepper with just a little more kick. The possibilities are endless here! Once again, I realize how spoiled I am to have such fresh, local foods available right in my (almost) back yard! Can you believe this?! Our little strawberry stand is open! They did that thing where plastic coats the rows of dirt and strawberry plants are planted. 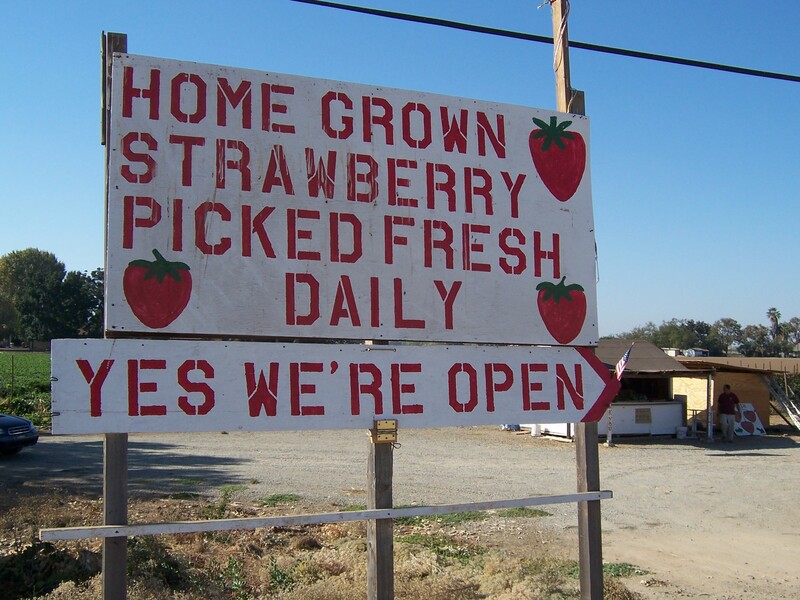 Of course I stopped by to pick up a few baskets of their sweet strawberries. How could I not? They are also growing what looks like a large backyard garden with some peppers, green onions, and some kind of leafy greens. The owner told me that they will be open Friday to Sundays for about one month here. 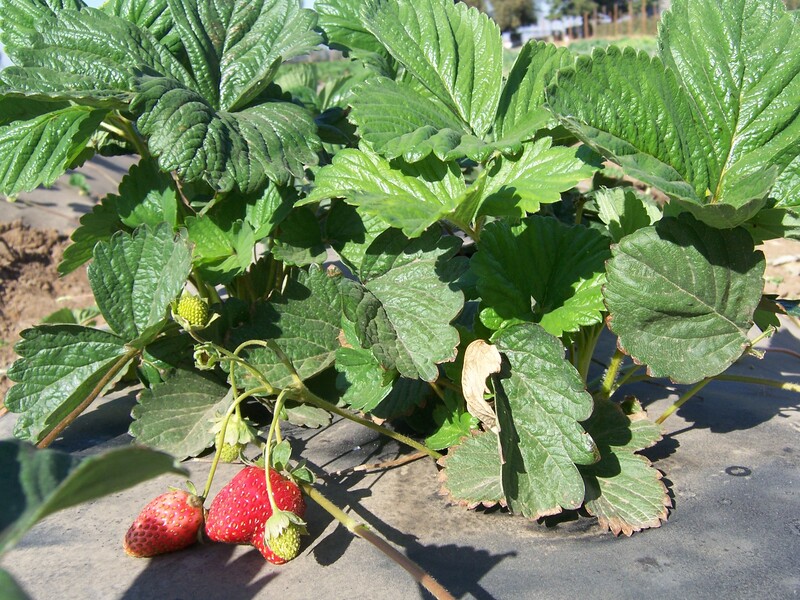 The good news on their end is that these strawberry plants produce a bit of fruit now, then get the season started again for them in April. Double the pleasure, double the fun! Now, what to do with strawberries in October? Any ideas? 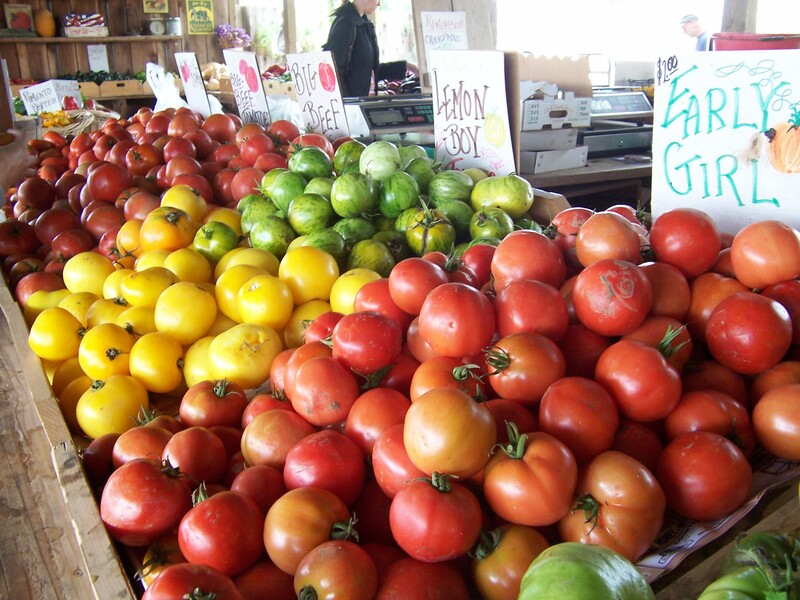 Farm stands can be found seemingly everywhere in mid summer, but by now, most have either closed their doors for the season or have drastically scaled back offerings. All except Smith Family Farms. 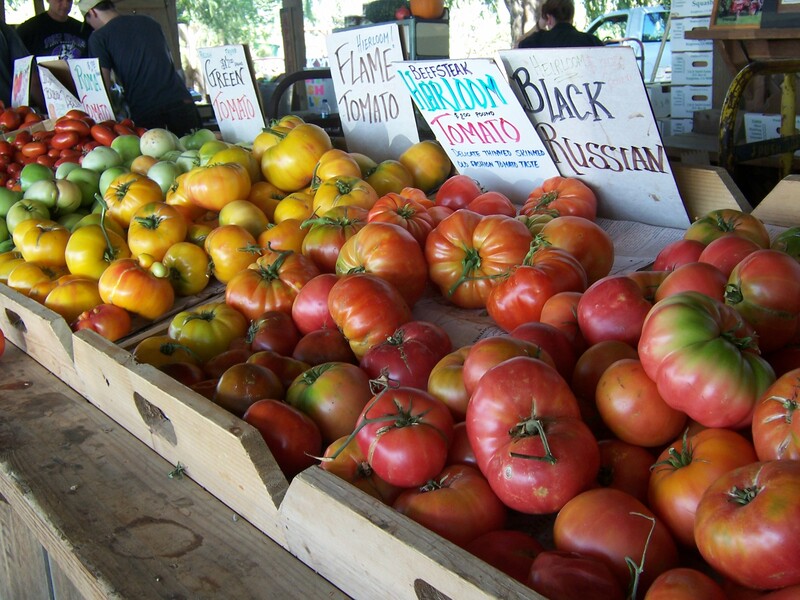 The bounty of the seasons continues to shine at this stylish, local favorite spot! I’ve done all of my produce shopping there the past few weeks and was impressed to find an amazing array of local foods as well as a full parking lot. It is wonderful when a local business can shine so brightly! Upon entering the area, you’ll quickly notice a little sense of humor, in that the squash(es) with the funniest shapes are prominently displayed. Artful displays, such as these tomatoes on the back of an old truck abound. As I was born totally without the art gene, I sooooooooo appreciate those with such skills! For most of us, the season for real tomatoes has passed us by and we’re left figuring out if we want to go for those red orbs in the grocery store that look like a tomato but taste like cardboard. 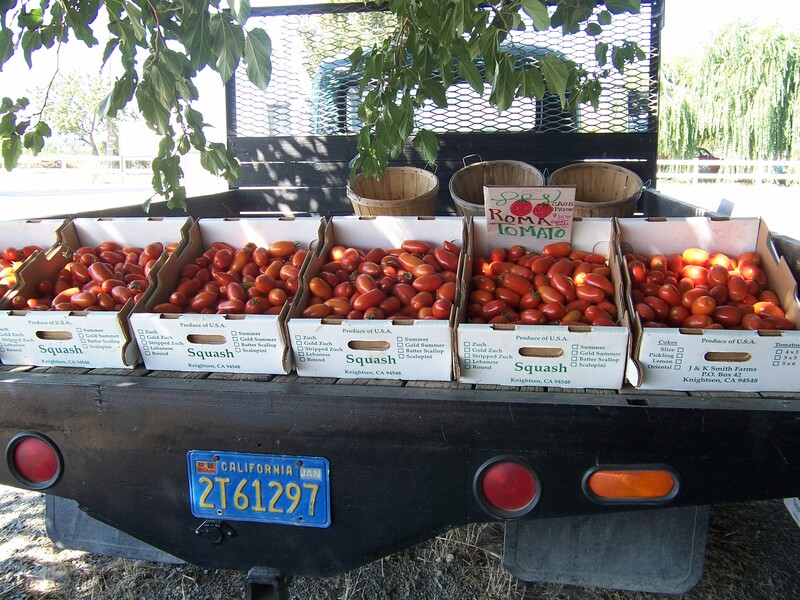 At Smith Family Farms, they space out plantings for months, then just keep harvesting and selling the real deal tomatoes as long as they can. Yum! 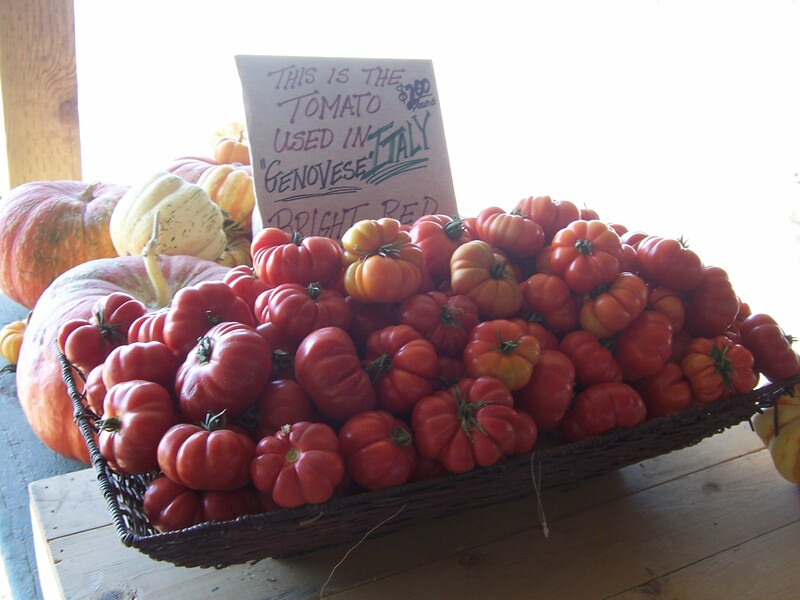 They just put out a new type of cute little Genovese tomato that may just fulfill my desire to prepare some marinara sauce to freeze for the winter before. (OK, I have said this for the past 3 years, but maybe, just maybe, this will be the year for me!) When asking about them, I was told that a few local chefs are having a great time hollowing out these little cuties and filling them with crab salad in their restaurants. Ooo, that sounds fantastic! And peppers. Wherever there are tomatoes, there must be peppers nearby. How tempting are these? All in all, its a tough life for a foodie, I know. But, I’ll gladly take you along for the ride!